This morning we went walking in the fields that had lots of yaks and cows. Toby and Kalika had cow patty fight. 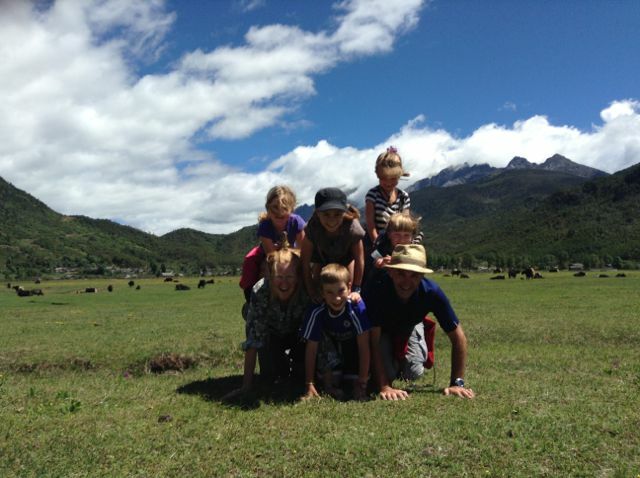 We made a family pyramid and jumped over creeks. We walked on logs that were laying over the creeks with our tour guide for China – Yeshi. 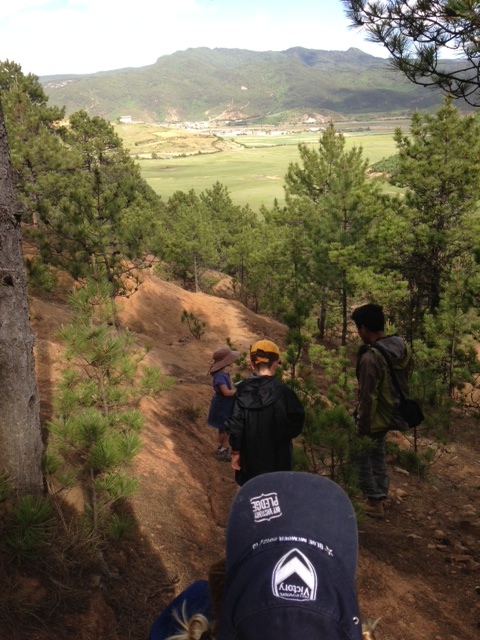 Today we did a 4 hr walk over mountains and grasslands from Shangri-La to a Tibetan village called ‘Four Village’. The walk was long and steep at stages but not really hard. Yeshi was singing Tibetan songs on the way. We made crowns out of yellow flowers. When we arrived at the village Zoi and Emilio were playing with some of the Tibetan kids. Mum, Zoi and Emilio drove to the village with our driver Kham because we started a bit late in the afternoon and Yeshi thought it might be a bit hard for the little ones. 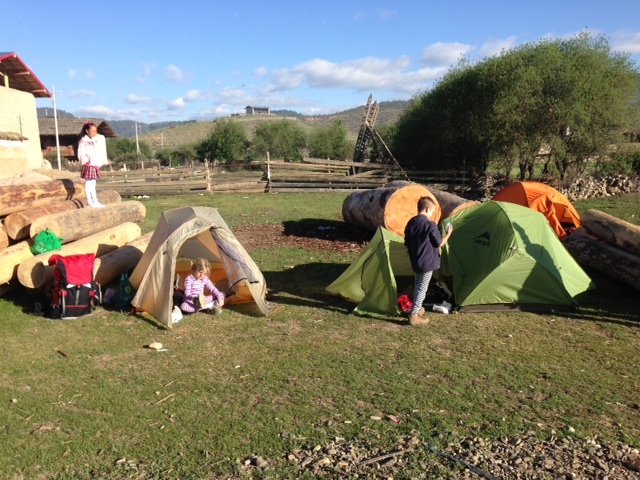 We set up our tents in a family’s backyard and then we had dinner with a Tibetan family in the village. There house was really big with a room that didn’t have much in it – that’s where we ate. There was lots of ham drying hanging from the ceiling and yak cheese drying and getting smoked over the pots. We had rice, Tibetan bread and lots of veggie dishes. I didn’t really like the yak meat. It was too cold and fatty. After dinner we went back to our tents and it was freezing at night because we were 3300m above sea level – but we jumped into our sleeping bags and were as warm as toast. In the morning we packed up and had breakfast with the same Tibetan family – Kalika, Zoi and Emilio made friends with the two little girls – for breakfast we had tea with Tibetan steamed bread, little biscuit things like pita that is fried and carrot cake. We could dip all these things in our tea. My baba loved drinking the yak butter tea but only he and Yeshi did. We went to a national park called Pu da Cuo national park – we got to go around on buses and a boat across the lake – we could have walked the whole way but it would take too long and we would miss the Tibetan horse racing festival. The park was alright – it had lots of yaks and pine trees – but on this trip the ‘Stone forest’ National park is my favourite. There are so many people that want to take photos of us – sometimes they don’t even ask – I often hide behind my mum and dad because I don’t like my photo being taken so much. I think they want photos because I have lighter hair and because there are 5 strange looking kids to them. We went to the Tibetan horse racing festival – there was such a traffic jam – the racing was a fast trot (not really galloping). The jockeys leaned back a lot and pulled on the horses and they looked a bit scared like they hadn’t done it before. This festival only happens once a year when the rest of China celebrates the dragon boat festival. It was a national holiday so we to to not do any school work as well. There was lots of army around at the festival and lots of rubbish floating around everywhere. 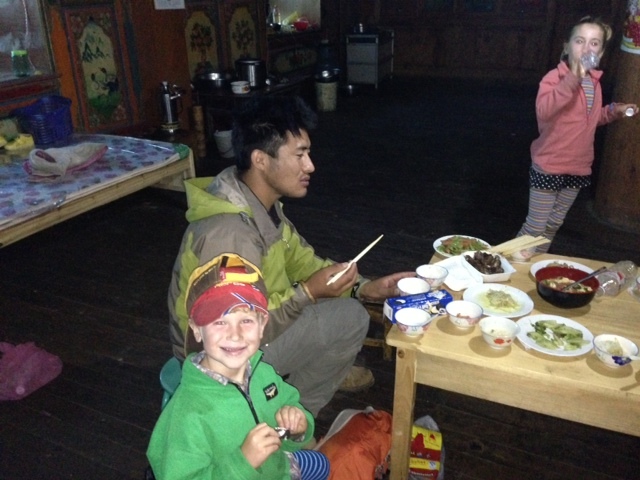 At night we had dinner in Shangri-La at a Tibetan house – we would never had found it if we didn’t have Yeshi want there. The table was set out beautifully – the mashed potato was delicious and Toby said that it was the 2nd best mashed potato in the world after our giagia’s. It was made with yak butter. My favourite dishes were the fried meat and beans and the mashed potato. There were these vegetarian dumpling things called ‘momos’ – they were strange but yum. We had yak raisin cheese cake and fruit for dessert.